Blockchain technology’s disruptive force in business and commerce has been well documented. With strong momentum ensuing from its beginnings as the foundational technology supporting Bitcoin, distributed ledger technology shows great promise in terms of its potential impact on the future of our planet. One emerging enterprise at the nexus of these developments is The NAGA Group AG, a German fintech company. NAGA’s strategic aim is to create world-class mobile and web applications for the capital markets and gaming sectors, along with cutting edge, blockchain-based solutions. Listed on the Frankfurt Stock Exchange as one of Europe’s fastest growing fintech firms, with six offices operating in five countries, NAGA’s successful IPO in July 2017 sparked a share price increase of 500 percent within less than three months. Indicative of its strong advancement as a curator of cutting-edge concepts and business ideas, NAGA is backed by a number of high profile shareholders, including the Chinese Fosun Group and Hauck & Aufhäuser (one of Europe’s oldest banks founded in 1796). “We Don’t Copy, We Disrupt” is a key theme undergirding NAGA’s roadmap of progress. Employing a highly data-driven approach, it aims to reimagine the prevailing banking sector model through innovative, transparent and simplistic mobile-first concepts. All product development and design efforts target international expansion and a global marketing solutions. NAGA’s foundational ecosystem is based on SwipeStox, an existing iOS and Android app and online trading platform that functions as a social network for traders. Operational since early 2015, this network is utilized by hundreds of thousands of registered users, facilitating over 200,000 monthly transactions at the tune of more than $4 billion. Signaling its next significant breakthrough, NAGA Group and Deutsche Börse formed a joint venture called Switex in December 2016. This venture merges the financial trading world with the gaming world, allowing users to trade in-game merchandise. Currently under development, Switex is scheduled to launch in beta form in Q1 of 2018. NAGA is also scheduled to launch a digital wallet that will align both platforms noted above. This will allow tokens to be stored so that individuals can use them for SwipeStox, Switex and other forthcoming projects such as the NAGA Trading Academy. This tool will also provide a mechanism for the conversion of blockchain assets such as bitcoin, ether, litecoin and others. Moreover, NAGA plans to launch a debit card which will support users in their desire to spend cryptocurrencies both online and offline. The NAGA Group AG was recently buoyed by the announcement that Roger Ver and Mate Tokay, Bitcoin.com’s CEO and COO respectively, had joined the company’s team of advisors. Through the influence of these two cryptocurrency leaders, the company hopes to fuel the next iteration of barrier-free investing into stocks or virtual goods through its forthcoming proprietary token, NAGA Coin. As arguably Bitcoin’s first angel investor, having funded the seed rounds for a majority of the entire first generation of Bitcoin-related businesses, including the Bitcoin Foundation, Bitpay, Blockchain.info, Ripple and Kraken, Ver is considered a prominent voice and strong advocate for Bitcoin adoption around the world. His philosophy and ideology of libertarianism and “voluntarism” align pretty succinctly with those espoused by NAGA. Ver holds the view that every person on the planet has the right to freedom of choice, voluntary association and self-governance. This assertion aligns well with NAGA’s aim to build a supportive ecosystem which will allow underbanked individuals throughout the world to participate in financial and crypto markets. This opportunity for involvement in the world of trading and investing is seen as a critical step to fostering financial independence and free lifestyles. Ver’s colleague, Tokay, is also an active and vocal proponent of Bitcoin. Having cut his teeth as a Bitcoin miner in 2013, Tokay continues to stay abreast of emerging crypto trends as part of his involvement with several successful blockchain-related projects. “I am thrilled to join the NAGA token sale as an advisor; they already have a working product that will allow millions of unbanked people to trade on the crypto markets and with that giving them the opportunity to reach financial freedom,” Tokay said. Dovetailing off of this news was the decision to add Bitcoin Cash (BCH) to the list of accepted cryptocurrencies for NAGA’s upcoming token sale. With the ultimate vision to establish a cryptocurrency that allows anyone to invest and trade easily and securely, NAGA will launch a token pre-sale on November 20, 2017. The Naga Development Association Ltd. will partner with the NAGA Group to introduce the ERC20-based token, NAGA Coin (NGC), a decentralized currency unit with the purpose of bringing together all of the platforms the NAGA network through its own proprietary NAGA Wallet. During the pre-sale, 20 million NGC tokens will be available with a 30 percent sale bonus. The main sale will then commence on December 1, 2017, and last until December 15, 2017. The maximum cap in tokens for the main sale is 200 million. 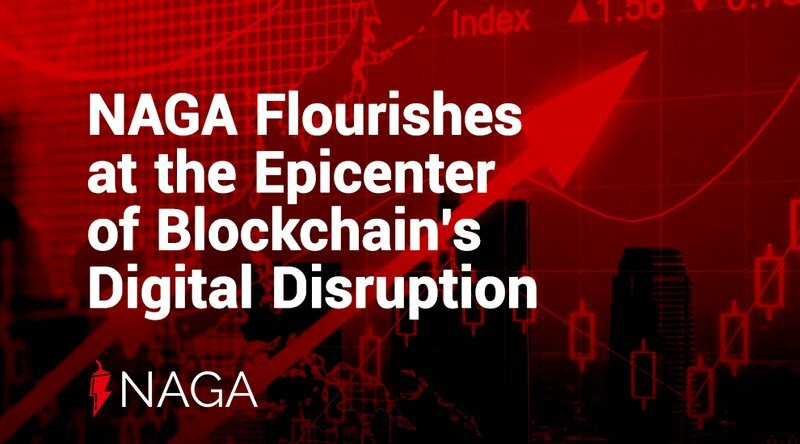 Learn more by visiting NAGA’s website as well as joining its Telegram chat.